Ryan has shown a lot more independence lately. From cooking his own meals, to putting himself to bed, we’ve seen clear growth in this area (and we’re not always happy about it — our “little” boy is not so little anymore!). Veronica determined to use some of their down time this summer to aid Ryan with other skills that will help both his independence and his socialization. Ryan has no interest in owning a cell phone. Unlike Riley, who bugged us for one at about age eight, got one at age 10, and is mad she has a hand-me-down instead of an iPhone at age 11, Ryan has made no such requests. While we don’t mind not adding another line to the monthly bill, and we figured a phone was just one more thing for him to lose, we also know it’s time. For good or bad, phones are how kids his age communicate. Not having one, and not having an interest in using one, is a barrier to forming social bonds. So Veronica determined to take some time with Ryan this summer to make sure he knows how to text and make calls. His phone skills have gotten better. 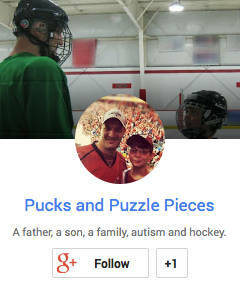 From non-existent a few years ago, he will now spend a few minutes on the phone talking to us or other family members if the subject is one of his liking, and has expressed interested in calling peers from school. But beyond an occasional text out of need, he has no interest in using a phone to communicate in that way. It requires a deep exhale. But in this case, I knew exactly what he was doing since Veronica had told me about her plan. 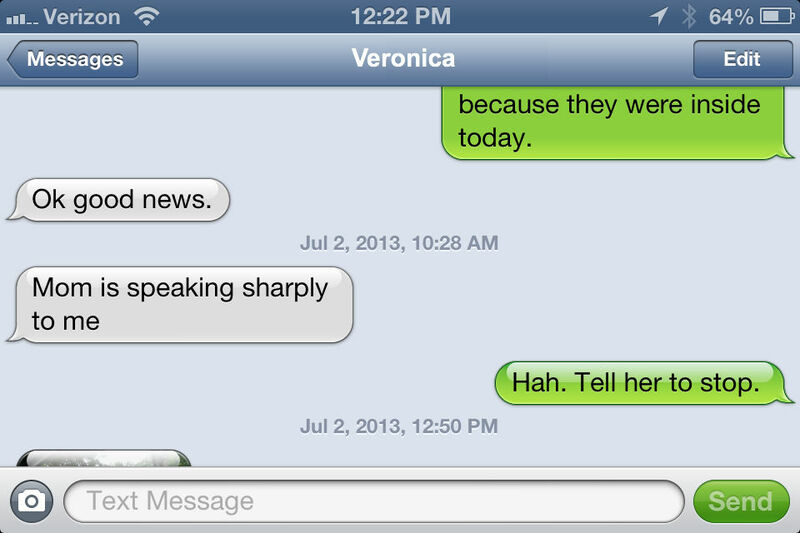 Later in the day, I got a text from Veronica that our water had gone out. Predictably, Ryan was very upset about this unforeseen development. Veronica made some calls, but the water company had no idea. A neighbor called the local police and they came to investigate. Veronica and some neighbors went outside to talk to the officer and learned that some maintenance work had resulted in a broken pipe that would be repaired in a few hours. A few minutes later I got another text, this time from Ryan’s iPad. Now, if you’re a regular reader here you may recall that Ryan enjoys cursing. He once told a neuro-psychologist that cursing was one of his hobbies. He once told me he dropped an f-bomb because of “gravity.” He thinks if he uses a word that sounds like a curse word but isn’t spelled just like it, that it somehow doesn’t count as a curse. He used to write stories with intentionally misspelled curse words in them to skirt the rules as well. 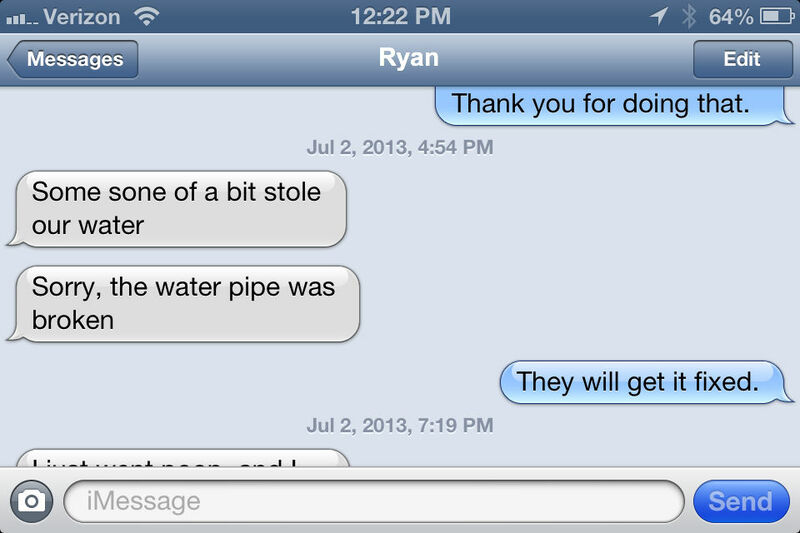 Someone stole our water, and Ryan’s not happy about it! I was at work when I received these texts, in a meeting with my boss. The first caused me to laugh out loud, the second, which came a few minutes later after Veronica explained the pipe was broken (which I knew because she was simultaneously texting me updates) simply to smile. Hey if someone stole my water, I’d be mad too. That is just awesome!! Our kids grow up too fast and its funny to see how they react to the world around them…oh and the cursing? yeah, my 8 year old loves to curse! now though he is saying “f-word” instead of the actual word or substituting a “word” that sounds like the curse word – I say that’s progress right? Uh, yes. Let’s agree to call it progress! There’s no question that the complete no-filter approach to life has a certain appeal.